When it comes to locating the luxury holiday destination, Waikiki is one spot that will not fail to please. Close to Venice, situated not far away from the banks of the dreamy Adriatic, Waikiki is one luxury camping site just waiting for your booking. Get in touch with a LUX-camp representative for details. Why Should I Choose Waikiki as My Next Holiday Camping Site? 70 pitches on 5 hectares of pristine land. A variety of on-site leisure activities. The sea and the swimming pool are only moments away from every mobile home. Any camping holiday should be as convenient and safe as possible, which is why Waikiki provides a host of only the most modern facilities within its resort complex. Wireless online connections, dedicated water and power supplies to mobile homes, wheelchair-accessible facilities and a complimentary laundrette are a few examples of what all guests can enjoy. Waikiki boasts a generous number of leisure options, with activities on offer for every single member of the family. Table tennis, volleyball and an open-air pool are all ideal for those who are travelling with friends or family. 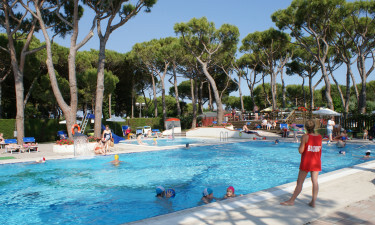 There is even a fun water slide for the little ones to enjoy while parents soak up the warming rays of the Italian sun. Waikiki is a luxury camping resort due in no small part to the tempting temperatures that can be enjoyed throughout most of the year. 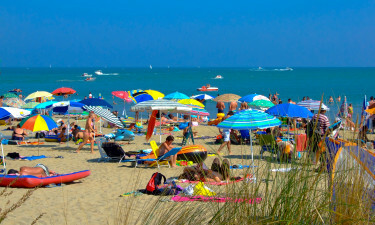 Thanks to its location at the confluence of the Adriatic and Mediterranean currents, the warm waters afford an equally mild climate. Winters will rarely experience temperatures that fall below freezing while even the height of summer boasts cooling sea breezes, making Waikiki an all-round favourite for Italian camping resorts. With the camp’s opening season falling in midsummer, you’ll be able to get the best of this location’s weather – the perfect escape from less predictable summer climates! What would camping in luxury be without the possibility to enjoy a fine Italian meal directly within the comfort of this holiday camping site? Waikiki offers an on-site restaurant-bar combination. Pizzas, pasta dishes and fresh salads are but a few of the delicacies that any foodie will enjoy. 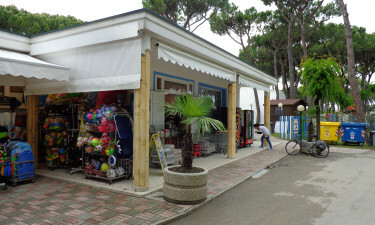 Fresh fish and meats are also available; many of these caught locally, and a snack bar is open every morning and provides a takeaway menu as well as foods for children. Finally, their wine and cocktail "corner" serves up a delicious aperitif or an alluring cocktail for those who wish to quench their thirst. A supermarket known as Despar will provide all guests with a choice of the most common national and international foods. Fresh fruits and vegetables are found alongside the tempting smell of locally baked bread, and other common provisions such as sanitary products and camping basics can be found here. Foreign newspapers, postcards, stamps, tobacco products and a selection of souvenirs are some other options within this retail centre. Just contact LUX-camp to be provided with further details.